Miksang: The Art of Seeing. It’s 8:30 in the morning and I am kneeling on a stone path parallel to the Twickenham riverside. From behind, it probably looks like I’m praying. And in some respects that isn’t so far from the truth. This strange behaviour can all be traced to my current romance with ‘seeing.’ As I crouch down and bring my camera lens close to the ground, I am trying to capture the elusive, highly intangible moment of perception when my eye first came in contact with the object that is before me. I know on some level that for a nanosecond it wasn’t a ‘leaf.’ It didn’t have a label attached to it at all. The word, as I utter it now, seems bizarre to me… How could ‘leaf’ ever encompass the visually diverse tree gifts I’ve been photographing for the last hour on my dog walk? The simple answer is: It can’t. Before I position my camera I spend a long time looking. I connect to what I am seeing with a depth and an intimacy that feel unfathomably rare and precious. I take in the colour, the shape, the areas that are being emphasised by darkness or light. I relish the contrast of the frail and crinkly against the smooth and hard. As I am fairly new to this process, I’m still learning what it is ‘to see.’ Miksang, which means ‘good eye’ in Tibetan, is a form of contemplative photography. It involves placing our awareness in our sense of sight, and expressing our visual perceptions exactly as we experience them. Every time I take my camera out I’m trying to unlearn the dull substitutes for seeing which most of us mistake for vision: labelling and categorisation. This is a tree. This is a path. This is a pretty tree. This is an ugly path strewed with litter. Good and bad. Right and wrong. Pleasant and unpleasant. It never occurred to me that the zen koan: ‘what is this?’ could prove so illuminating when staring at the ground. 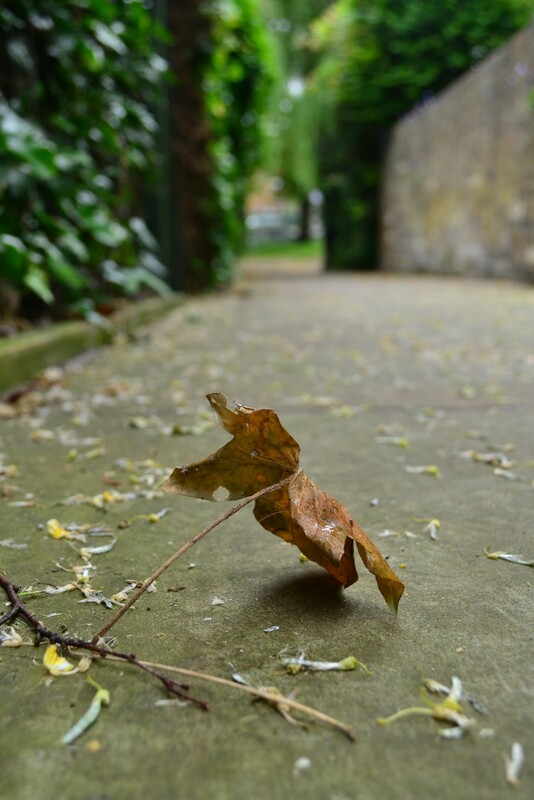 What arrested me by this particular leaf was a ‘ballet quality.’ She looks as if she’s been frozen in the midst of a fall, her long elegant stem and her paper thin body barely in contact with the ground. It was also the soft golden elegance of her colour and texture, and the abundance of space she has for her dance. My own exploration of Miksang has resulted in moments of unadulterated gratitude, peace, beauty, and not surprisingly… joy. The more I look in this way, the more I am moved by the peeling paint on a bridge or the bold orange of an average traffic cone. Attuned to the endless combinations of colour, pattern, texture, light and space, what I see becomes a true feast.